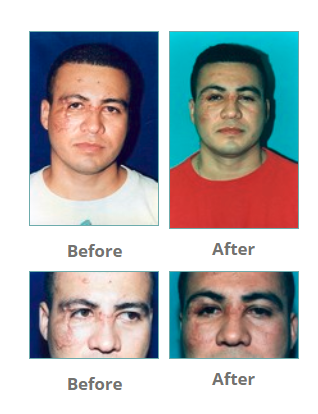 Scars can be revised with a combination of therapies and surgery. Some scars need to be reoriented to heal better. Some may need what we call z-plasty or W-plasty. Sometimes steroid injections will help. Sometimes the use of lasers or massage and pressure will improve the scars. Some patients have associated problems with their ear lobe from previous piercings. This includes painful cysts and keloids that can occur in the ear lobe. These can be treated and removed at the same time the split ear lobe is repaired. Some additional treatment with steroids and or radiation is required in patients with keloids to minimize their recurrence. Pressure earring in the form of clip on earrings helps to decrease the recurrence of keloids. It also helps to soften the scars. Patients with previous keloids that have been successfully treated should not have their ear lobes pierced again since this may result in the development of keloids once again. Whatever the case may be it will be tailored to fit your needs. Please give the office a call at 718-246-0130 or email me at Normanbdaymd@gmail.com to be evaluated. Many of these procedures are covered by insurance. Keloids are always covered.